An unaltered photocopy of your DD-214, NGB or other military issued document clearly displaying your award of the USAF Expeditionary Ribbon. Contact The War Library if you do not have a DD-214, NGB or other Report of Separation: 1-562-422-4100 (Pacific Time Zone). 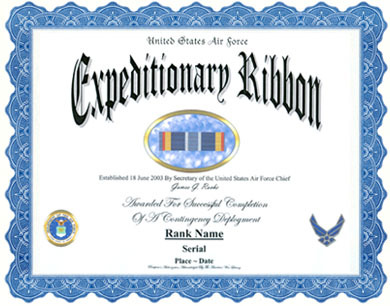 The Air Force Expeditionary Service Ribbon was established by Secretary of the Air Force James G. Roche on June 18, 2003. This ribbon has been made retroactive to cover completion of contingency deployments subsequent to October 1, 1999. This is an Air Force achievement award and consists of a ribbon-only (there is no medal). -- The Air Force Expeditionary Service Ribbon is awarded to military members of the Air Force who are credited with completion of a contingency deployment. -- "Deployment" is defined as either deployment on contingency, exercise, deployment (CED) orders, or members sourced in direct support (in-theater or out) of expeditionary operations with an overnight away-from-home station. -- To qualify for this ribbon, individuals must have deployed for 45 consecutive days or 90 nonconsecutive days on a deployed status. -- Any contingency deployment qualifies, overseas or stateside, regardless of the duty, destination, or location of the temporary duty. -- There is no time limit to accumulate the 90 non-consecutive days (members keep accumulating contingency Temporary Duty days until they reach 90 days). -- The intent of this ribbon is one Air Force Expeditionary Service Ribbon for each deployment (provided the required deployment days are met). It is not intended to be awarded in multiples corresponding to each 45 consecutive days deployed. -- Permanent party overseas personnel are not eligible for this ribbon unless they are forward deployed on a contingency deployment. -- Members on an overseas short tour may receive both the Air Force Expeditionary Service Ribbon and the Overseas Short Tour ribbon, provided they meet the requirements of both. Additional awards are denoted by bronze oak leaf clusters (a silver oak leaf cluster denotes a sixth award). 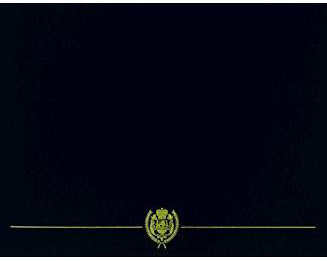 A gold border is authorized to signify satisfactory partipation in combat operations. In addition to the criteria for time in the area of responsibility, Airmen who are wounded or who die while serving in the area, and those who participate in mililary operations into the designated area and who launch weapons into the area will qualify for the gold border. This inlcudes air mobolity and bomber aircrews flying missions outside the area of responsibility, as well as Airmen involved in space operations and remotely piloted vehicle operations that produce weapons effect in the area of responsibility. This ribbon is arranged in eleven stripes in a symetrical pattern. The center stripe is light blue and stands for Air Force capability. From this center stripe outward on each side, the narrow white stripe stands for integrity; ultramarine blue represents worldwide deployment; Air Force yellow stands for excellence, and the last two stripes (scarlet and blue) stand for the United States.